Marriott Aruba Ocean Club even though it is located at the beautiful Palm Beach, the cascading rock pool will soothe you after an adventurous day of scuba diving in Aruba. You may decide to stay at the Marriott Aruba Ocean Villas, however you are allowed additional use of the fitness facilities, Stellaris Casino and Kid's Club activities of another Marriott Resort nearby. 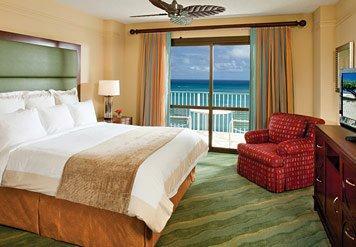 Your choice of a villa or guest room at the Marriott Ocean Club can be either a one or 2 bedroom. Full amenities are provided such as a fully equipped kitchen where cookware, appliances and tableware are avialable to you. This means that you can prepare meals for your family. Even enjoy ocean views on your private balcony after a fun-filled day of diving.